Over 350 American soldiers and 80 US Army vehicles with US Air Force cover will begin a 400-kilometer march across Romania this week, signaling the start of multinational NATO war games in Romania. Troops with the 2nd Squadron, 2nd Cavalry Regiment, will kick off from the Mikhail Kogalniceanu Air Base and will march to the Romanian Land Forces Combat Training Center in Cincu, where they will meet Canadian, British, and Romanian counterparts, Pentagon announced on Tuesday. The military exercise involving 1,500 troops from the four NATO countries takes place between May 15 and June 6. 2nd Squadron Commander, Lt. Col. Theodore A. Johnson says the purpose of the mission is to reassure NATO Allies, especially Romania. “This event will demonstrate our strong relationship with Romania and our ability to move freely along interior lines across the NATO Alliance,” said Johnson. The Canadian, UK, US and Romanian exercises will also involve A-10 Thunderbolt II's from the 354th Expeditionary Fighter Squadron, which will demonstrate close-air-support by conducting multiple close passes above the convoy. “This will also be a combined effort to show interoperability and we will defer to the Romanian Armed Forces on all coordination and emerging issues,” said Lt. Col. Johnson. Estonia is another European country hosting joint military exercises in May. Service personnel involving over 7,000 reservists and 13,000 troops from Estonia and allied countries began mobilization exercise Siil 2015 in locations all over Estonia. The exercise includes M1 Abrams tanks and Bradley armored vehicles. The show of force by the US Army and its NATO allies in Eastern Europe and near Russia’s borders is becoming a regular affair, on the back drop of the rising tension between Moscow and the West. Washington and its European allies continue to accuse the Kremlin of destabilizing the situation in Ukraine. Russia dismisses all such allegations, at the same time condemning NATO’s frequent army exercises and military buildup near its borders. On Tuesday, Russia’s permanent mission to NATO released an analytical document on its website saying that the accusations by NATO officials of the so-called “Russian aggression in South-Eastern Ukraine,” remain unfounded and ungrounded. NATO Response Force (NRF) in Europe with its system of logistic support, including warehousing facilities for military equipment, ammunition, fuels and lubricants, and other supplies, was initially charged with targeting terrorist organizations. However since mid-2014 it provides for getting ready to face and meet an “aggression of an eastern neighbor," implying Russia, according to the Russian permanent mission to NATO article. 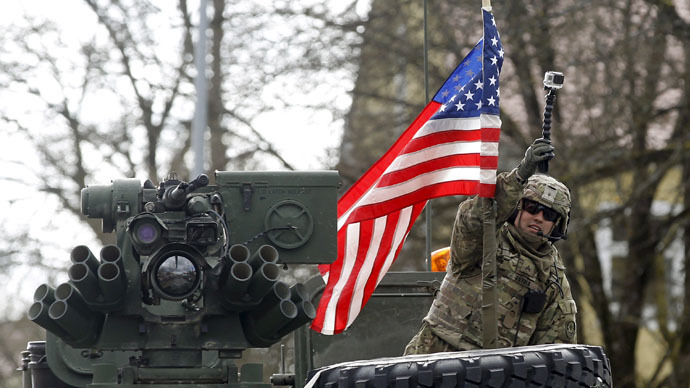 The latest muscle flexing by NATO forces took place in March and April when the US Army's "Dragoon Ride" saw a convoy of US military vehicles heading to a base in the German town of Vilseck in Bavaria via Estonia, Lithuania, Poland, Latvia and the Czech Republic. According to Lt. Gen Ben Hodges, the commanding general of US Army Europe, the purpose of the march was "to assure those allies that live closest to the Bear that we are here." While on a tour of Eastern Europe Pentagon officials have also made it clear that they want to garner support from the local civilian population by parading their armor through various towns. However, the US military convoy was sometimes given a cold shoulder not only in countries closer to Russia but in Germany as well. The latest exercises are meant to be a part of the yearlong Operation Atlantic Resolve, which aims to “reassure NATO allies and partners of America's dedication to enduring peace and stability in the region,” following the recent developments in Ukraine. Earlier this year US officials announced plans to expand its series of exercises, to include Estonia, Romania, Hungary, the Czech Republic and Russia's southern neighbor, Georgia.